✅MOUTHWATERING COFFEE, TIMELESS DESIGN: So you want a gorgeous, simple glass pour over coffee maker? With permanent stainless steel micro-ground filter? One that’s easy to use, dishwasher safe, environmentally friendly, and makes the best coffee you’ve ever tasted? This is it. ✅RICHEST BREW – BARISTAS CHOICE: You know when someone says, “You have to experience it to really understand it?” Yeah, it’s like that. Because the coffee brewer’s unique filter technology filters through only the richest, creamiest, aromatic brew – for a cuppa you’ll crave every day. ✅SHOCKINGLY STURDY – ART MEETS SCIENCE: While our glass coffeemaker looks more like ART than science, it’s ENGINEERED from ultra-durable, BPA FREE BOROSILICATE GLASS, so it does more than beautify your kitchen – it stays chip, crack and splinter free for longer than any other. ✅AMAZING VALUE – EVERYTHING YOU NEED: Stop wasting money on paper filters or cheap metal filters that rust out. 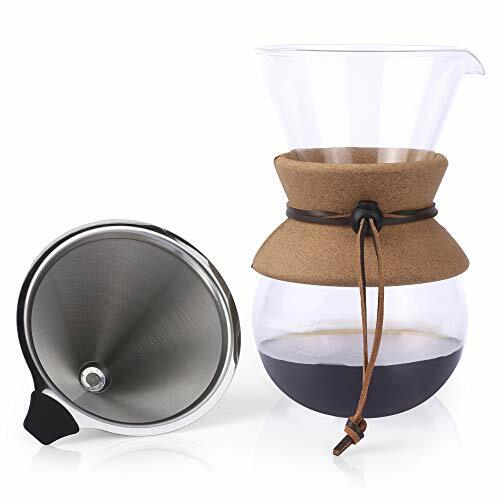 Pour over coffee carafe set includes Gorgeous Glass Carafe Coffee Dripper Pot, Stainless Steel Filter & Cork Lid – the best of everything, all in one set. ✅BEST HAND DRIP COFFEE MAKER – 2X GUARANTEED: Coffee aficionados SAY this is ‘the one to get’. It’s thoughtfully designed, solidly constructed & backed by a 30 day ‘love it or your money back guarantee’ plus a full 1-year warranty. Get this ‘best in class’ pour over drip brewer today. Simply good coffee! looks great, and does make a good coffee. I would recommend using the paper filters also with this, the steel mesh is fine but it doesn’t hold water for long enough and you end up with a weak drink. Great Value Fantastic product, great coffee maker. Simple to use, looks good. The simple way to make coffee is the best.